Why changing your image size matters. One of the top reasons you probably want to change your images size is to optimize your website's speed. The bigger your photo's file size is, the slower your site will load and perform. Remember, we're focusing on file size, how much data room your photo takes up, not how big it's dimensions are, although they do go hand-in-hand a bit. Rest assured it's still possible to have a gorgeous looking wide and tall photo with a small memory footprint. We're shooting for 256kb or less. To check your image's file size hover your pointer over your image or right click and select "Properties"
The original photo that we're going to resize in Windows Paint is 2.12MBs. WAY too big for web use. If you're on a Mac, or would prefer to resize your photo on an Apple computer we have an article on how to do that here. 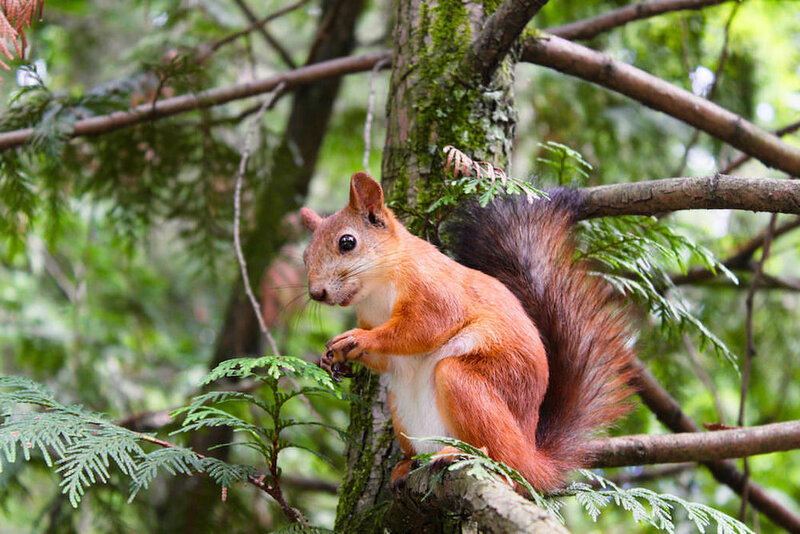 For this example we went to Pexels (wonderful source for royalty free stock images) and pulled a random photo of a cute little squirrel. Oregonians am I right? TIP: Duplicate your image before working on it. All of these adjustments we'll be making are permanent, can't take 'em back, so it might be a good idea to save your original. It's nice to have a backup large, high resolution photo in case you need or if you mess up.. To do this just right click on the image, select "Copy", then right click on your desktop and click "Paste". Finished Royalty free Pexels photo that we resized in Windows Paint of one thuggish squirrel. Click on the image above to see it full size. Pretty great resolution for only a 200KB file huh?! In Windows 10 your photo will automatically open in the default Photos application when clicked, so to open your image in Paint you'll want to right click, hover over "Open With", and then select Paint. To open your photo in Windows Paint if it isn't your default - Right Click, Open With, Paint. Up towards the top left of your image, in the toolbar, you'll see "Resize". Click on that. At the upper left of your screen, in the toolbar, click "Resize". You could resize your photo by percentage, but that's more guessing than accurately adjusting dimensions. By clicking "Pixels" you'll be making sure you end up with an optimally sized photo. Also make sure "Maintain Aspect Ratio" is selected. If you don't have this selected you'll might end up with some severe and screwy distortions in your photo. No bueno. To quote SNL's Dana Carvey impersonating George H. W. Bush, "Not gonna do it. Not prudent." Adjust your photo's size by pixels, not by percentage. Adjust the longest size of your image by it's pixels. You want to make just the longest side of your photo smaller to make sure it doesn't get wonky. Since you kept "Maintain aspect ratio" selected the other dimension will adjust with the longest. Adjusting the longest size of the photo automatically adjusts the shortest side to keep dimensions proportionate. The jury is out on what the optimal dimensions for a web-use photo are. Much of it depends on how you're going to use your photo. If your blog section of your site only displays at 800px wide, there's absolutely no need to go wider than that with your photo. In general, unless your photo is going to be a large, full-page background, 1,050 pixels as it's longest dimension is about the max you need. Here's a good example of why it's sometimes a good idea to make a copy of your original photo before editing it's size. Went too small with your adjustments? Duplicate your original then go back and try it again. Maintain aspect ratio to keep your photo from looking skewed. Adjust the longest side, 1050px max usually, then click OK.
Click OK, save, and close. Click OK, then save your new, trim and svelte photo, and exit. VOILA! Dropping just the dimensions down to 1,050px X 700px brought our file size from 16.3MB to a very conservative 108KB. Perfect for web use and creating a page with extra-fast loading speed. Make sure your changes are saved and then you're done! Don't quit your day job but definitely give Odell Beckham Jr. or Antonio Brown a run for their money with your celebration dance (after all, it's not like you're going to get flagged for excessive celebration or something). If your photo's file size is still pretty big, over 400kb, it might be a PNG file instead of a JPEG. If preserving any of the transparent aspects that come with a PNG file aren't important to you, go ahead and save your image from Paint as a JPEG. JPEGmini is a nifty application that compresses your image's file size even further without negatively changing your photo's appearance at all. Their paid version costs a little bit of money but they offer a free trial and the first 200 or something photos you run through the app are completely free. Oh yeah. JPEGmini will automatically reduce and optimize your photo. With a sweet resoltion of 201KB while still being a decently large 1050 x 700 px image. Wonderfully small, but still big dimensions-wise, web-optimized photo resized in Windows Paint!